Children and their families are invited. A live nativity with animals and a craft to take home will be featured. Children are encouraged to bring an item for the Food Bank to place beside the manger. Purchase $25.00 of merchandise in the store and you will be entered in a drawing to win a Red Box Smoker. Food for sale from 11 am – 7 pm. Participate in a Scavenger Hunt at Orrstown Bank and receive a gift. Donations made during this time to CrossNet Ministries gain an entry to a Grand Prize drawing. Visit elancocross.org for list of needed items. Make a donation to this worthy cause. Stop in for hot chocolate and cookies. Learn to make Creative No Bake Christmas Treats with Garden Spot Village Food Service from 1-2pm. Will be open. Register to win a laptop. Will be open. Register to win a wall clock. Discounts throughout the store. Enjoy some snacks. Will offer an in-house sampling of selected foods and nutritional products. Receive in-store discounts on all supplement vitamins & minerals and essential oils. Stop in and have your picture taken with Santa. Christian Fellowship Church will be offering free “Jesus” crosses, gospel wristbands for kids and teens and coffee mugs filled with candy while supplies last at Stauffer’s Drug Store, 149 East Main Street. Will be open with a drawing for a gift basket. New and like new books – perfect for gifts. Light Refreshments. Will be open with drawings for a gift basket, gift certificates and giveaways. Will be serving light refreshments. Dental goodies for kids and adults. Register to win a Honey Baked Ham. The Christmas Market Inside the Farmer’s Fair building at the corner of South Roberts Avenue and Franklin Street. Local vendors selling a variety of items including gifts, Christmas decorations and food for your holiday entertaining. Will be open with guided tours. Enjoy traditional decorations of Christmases past. Santa will visit with children from 10am-Noon. Will be open with drawings and giveaways. Enjoy singing by Gina Miller and Dean Fox throughout the day in the store. Wood Carving performed by Dean Fox in the alley west of the store. The New Holland Lions Club will be selling their delicious ham sandwiches. Boy Scout Troop 48 will be selling hot dogs at the Boy Scout Home on South Roberts Ave from Noon until 7pm. Cub Scouts Pack 148 will be selling soup. In house specials. Door prize drawing. Enjoy cookies and carols provided by Lighthouse Vocational Services from 2pm-3pm. Marty’s Flea Circus, sponsored by Theraflex Massage will perform at 1 and 3pm behind the Edward Jones Building on East Main Street. Register to win a free massage. Enjoy bagpiper, Walter Hamilton from 2pm-3pm. Open house, enjoy hot chocolate and spin the prize wheel. Learn to make Creative No Bake Christmas Treats with Garden Spot Village Food Service at Northwest Bank, 201 West Main Street. Mrs. Santa visits the Christmas Market in the Farm Show building to read to children. Meet Alpacas from Eastland Alpaca Farm at the south end of Roberts Avenue in front of the Christmas Market. Enjoy model train layouts, talking Thomas the Tank Engine and more. Enjoy cookies and carols from Lighthouse Vocational Services in front of Lickity Split, 209 East Main Street. An Ice Carving Demonstration at the corner of Roberts Avenue and Main Street. Enjoy taking interactive photos with the ice sculptures afterwards. Display of New Holland Ambulance Equipment at their building on South Roberts Avenue. Children’s Crafts at New Holland United Methodist Church, 120 West Main Street. Offering free Christmas shopping for kids Grade 6 and under. Meet the staff while enjoying refreshments. Enter to win 2 drawings, one for a pair of RayBan sunglasses and the other for a year’s supply of Bausch and Lomb contact lenses. Stop by their annual Christmas Photo Booth hosted by J. Eldon Zimmerman Photography. Giveaways for the kids! Enjoy festive music from Our Lady of Lourdes parish will stroll from St. Stephens Reformed Church, 249 East Main Street to Community Natural Foods, 128 East Main Street. Will be open. Register to win poinsettias. Face painting by the Kiwanis Club of New Holland. Visit Orrstown Bank’s tent on Robert’s Avenue to participate in a Scavenger Hunt and receive a gift. Donations made during this time to CrossNet Ministries gain an entry to a Grand Prize drawing. Visit elancocross.org for a list of needed items. The Bell Choirs of Garden Spot Village and St. Stephen Reformed Church will perform at St. Stephen Reformed Church, 249 East Main Street. Will be open with a drawing for a seasonal gift basket. Bagpiper Jason Bachman, will perform along Main Street between Kling & Deibler and North Roberts Avenue. 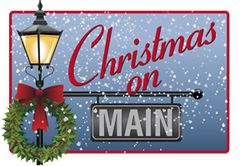 Petra Christian Fellowship will bring their children’s barrel train ride and Cocalico Print Shoppe will bring their plane train ride to Christmas on Main at the south end of Roberts Avenue near the Christmas Market. GMDSOUNDS will emcee the event providing you with information about the evening’s festivities and the countdown to the Tree Lighting. Invites you to stop by and warm up with hot chocolate. Stop in for cookies, hot chocolate and hot cider. Register to win a Sonicare toothbrush. ELANCO Library Volunteers will be reading Christmas stories by the fireplace. Carriage Rides leaving from the corner of Roberts Avenue & Main Street and Meadow Creek Barbeque Supply, 140 West Main Street. Carriage rides are one way only, so plan to stroll back through town or wait for the next carriage. The Rotary Club of New Holland will be assisting with loading and unloading passengers. Hay Rides provided by New Holland NA leaving from the corner of Roberts Avenue and Market Street. Stop by Refuge Calvary Chapel, 33 South Railroad Avenue, to warm up by a campfire and roast hot dogs. Listen to live Celtic Christmas music by Beyond the Pale and hear readings of Luke 2. Garden Spot Fire Rescue will display their trucks on North Roberts Avenue (Giveaways). Serrano’s Barber Lounge, 127 E Main St, will be hosting their Open House and serving light refreshments. Register to win a Gift Certificate. Edward Jones Investments, 201 E. Main Street, will be hosting a Hot Chocolate buffet. Music by Banjo, Ukulele and vocalist, John Dolan will sing nostalgic music from 4pm – 5pm. Guitarist and singer, Erin Varney will perform outside from 5:30-6:30pm. Deb Kramer of Merrill Lynch will be hosting gingerbread cookie decorating for the kids near Santa’s house on North Robert’s Avenue. Donations are being accepted for CrossNet Ministries. Santa’s Arrival (with a little help from Garden Spot Fire Rescue) at the corner of North Roberts Avenue and Main Street. Santa’s House provided by Lapp Structures. New Holland Band Brass Ensemble and Friends (Garden Spot High School Musicians) will be performing along Main Street. Garden Spot High School Vocal Ensemble will sing Christmas carols as they stroll through down Main Street New Holland. Mr. Sneakers will entertain with magic and balloon art at the corner of North Roberts Avenue and Main Street. New Holland Ambulance Association will have handouts and treats for kids near 116 East Main Street. View a Live Nativity presented by Lighthouse Assembly of God in front of Smoker Gard Associates, 121 East Main Street. Stable provided by Lapp Structures. Concert performed by Rugged Cross at the New Holland United Methodist Church, 120 West Main Street. Community Christmas Tree Lighting at the corner of North Roberts Avenue and Main Street. End the evening with a Christmas Tea at the New Holland United Methodist Church, 120 West Main Street. Will feature a large community chorus concert following the tree lighting in their sanctuary.